Traditional bibs protect your tot’s shirt, but what about when a heaping handful of spaghetti or blob of applesauce lands right in their lap? Yep, been there. Cleaned that. 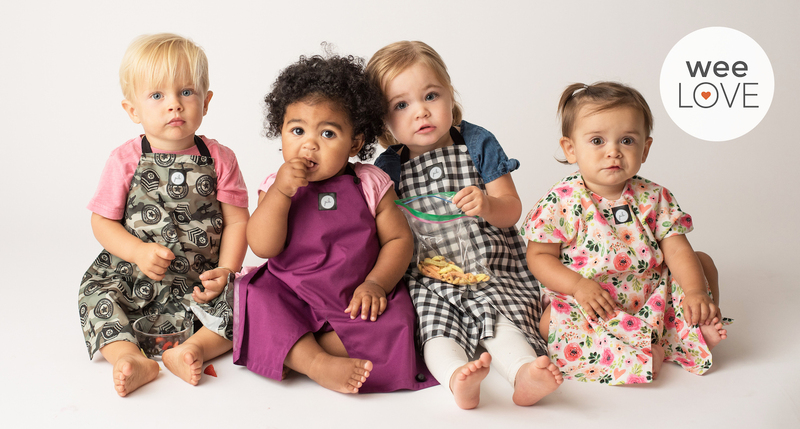 There’s a reinvented bib on the scene that protects your kiddo’s whole outfit: the Pib. Created by a mom who’d seen her fair share of stained baby clothes, this genius invention protects shirts, laps, and pants. The one-piece design includes leg panels that keep food off the whole outfit. Better yet, the snap closures around the neck and torso ensure the Pib stays on and in place (a win-win!). Available in apron or sleeved styles, the Pib is made from light, eco-friendly, breathable, waterproof fabric. It’s easy to wipe clean or throw in the wash, and especially comfy for your child to wear. The leg panels work seamlessly and safely with any highchair, stroller, or car seat for less messy meals on the go. From arrows to checkers, florals to camo, Pibs come in sizes 6m-3T, and you can get even more use by putting one on to protect clothes during arts and crafts time, too.